Nobel Laureate Sir Frank Macfarlane Burnet is considered one of the twentieth century's greatest scientists, and a true scientific hero. At a time when most talented young Australian scientists left for international positions, Sir Macfarlane Burnet remained in Australia and played a pivotal role in helping to build the field of medical research in this country. He made significant contributions to bacteriology, virology and immunology over his 59-year career, most of which was spent here at the Walter and Eliza Hall Institute. During Sir Macfarlane Burnet's term as director, the institute expanded in size, scope and profile. Midway through his term as director, a change in research focus and breakthrough discoveries established the institute as a world leader in immunology research. A medical graduate, Sir Macfarlane Burnet was determined to foster a strong connection between basic science and clinical medicine, a focus that continues at the institute to this day. Sir Macfarlane Burnet's initial appointment at the Walter and Eliza Hall Institute was as a pathology registrar, under our first director, Dr Sydney Patterson. Dr Patterson's successor, Dr Charles Kellaway, encouraged Sir Macfarlane Burnet to pursue research qualifications in the United Kingdom, where he trained in microbiology from 1925 to 1928. In 1928 Sir Macfarlane Burnet returned to the institute, where he remained until his retirement in 1965. He succeeded Dr Kellaway as director in 1944. One of his first actions as director was to establish a Clinical Research Unit. He ensured that the unit had its own ward within the new Royal Melbourne Hospital and appointed as its head the well-known gastroenterologist, Dr Ian Wood. Sir Macfarlane Burnet made several notable appointments during his tenure, including biochemists Dr Alfred Gottschalk and Professor Gordon Ada, and virologists Professor Frank Fenner, Dr Eric French and Dr Stephen Fazekas. The growing reputation of the institute also drew an increasing number of visiting scientists from overseas. During the Burnet era, many younger scientists also developed their careers at the institute. These included Professor Donald Metcalf and Sir Gustav Nossal. “Burnet is remembered as an intuitive thinker and a great example of an eclectic statesman scientist… However, Australians remember Sir Mac for another important reason. While science is ultimately shared and free of boundaries, Burnet seems to have realized early in his career that he could play a role in the development of medical research in the young country of Australia. An eminent virologist and microbiologist, Sir Macfarlane Burnet made important discoveries about significant viral diseases of the era including influenza, herpes, poliomyelitis and Murray Valley Encephalitis (MVE), as well as bacterial diseases including psittacosis and Q fever, the causative agent of which, Coxiella burnetii, was named in his honour. At the outbreak of World War II, Sir Macfarlane Burnet focused the institute’s research program on producing an influenza vaccine, to counter the potential for a repeat of the devastating influenza pandemic in the aftermath of World War I. He also expanded the institute’s research effort into tropical infections including scrub typhus, a disease that was prevalent in Australian troops in North Queensland and New Guinea. This research claimed the life of a promising colleague, Miss Dora Lush. In the early 1950s, Dr Eric French and Sir Macfarlane Burnet proved an outbreak of encephalitis in the Mildura region was due to MVE and not, as feared, the myxomatosis virus that had just been released to control rabbits. Famously, Sir Macfarlane Burnet, Professor Frank Fenner and Sir Ian Clunies-Ross allayed public fears by inoculating themselves with myxomatosis virus, demonstrating it had no effect on humans. Sir Macfarlane Burnet's research into infectious diseases had included forays into studying the immune response to infectious agents. In the 1940s, he had become to publish his research and theories in how the immune system functions. By 1957, Sir Macfarlane Burnet had decided that immunology research was an area of huge importance. Almost overnight, immunology became the major preoccupation of the institute. Sir Macfarlane Burnet’s decision soon placed the institute at the forefront of global immunology research, with almost 50 per cent of the world immunology literature coming from the institute in the next decade. In 1959, Sir Macfarlane Burnet published a seminal paper describing his clonal selection theory of antibody production. The theory revolutionised our understanding of the immune system, and to this day it underpins our understanding of disease and the way our bodies respond to it. Sir Macfarlane Burnet’s research into immune tolerance - how our immune system avoids attacking our body's tissues - saw him awarded the 1960 Nobel Prize for Physiology or Medicine with his collaborator, Sir Peter Medawar. On his retirement in 1965, Sir Macfarlane Burnet was succeeded by his protégé, Sir Gustav Nossal. His enormous impact on scientific understanding, and on delivering the institute to international prominence, remains his enduring legacy. In addition to the Nobel Prize, Sir Frank Macfarlane Burnet’s scientific genius has been recognised by many international and Australian awards. Sir Macfarlane Burnet’s legacy has been honoured in many ways. He has been commemorated on several Australian stamps, and even a Melbourne tram. Since 1971 the Australian Academy of Science has awarded The Macfarlane Burnet Medal to outstanding scientists. In 1986 the new Burnet Institute was named in honour of Sir Macfarlane Burnet, following his commitment to studying virology, immunology and improving public health. We continue to celebrate Sir Macfarlane Burnet achievements with the annual Burnet Prize, established in 1987 through a gift in Sir Macfarlane Burnet's will, and awarded to young scientists who have produced pioneering research. 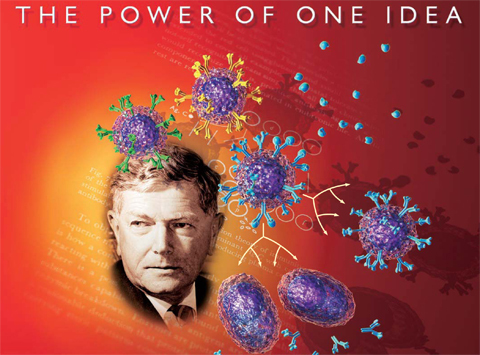 The story of Sir Frank Macfarlane Burnet and his theory of clonal selection which profoundly and forever changed the way that scientists all over the world understand the working of immunity. Note: This publication is no longer available in hard copy.